Pumpkins for sale, a photo by PhotoPuddle on Flickr. As a rule my dreams are rubbish. Really vivid but for some reason very melancholic. Apart from the fact that it means I have to get up I am rarely that fussed to wake up from them. This morning I was having a suitably rubbish dream but this time I was a bit disappointed when I woke up. I was annoyed because in my dream I had taken some really fabulous photographs which of course didn't find their way onto my camera in real life. I obviously can't show you my dream photos but trust me they were great. Instead I will show you a snap I took on my iPhone today. 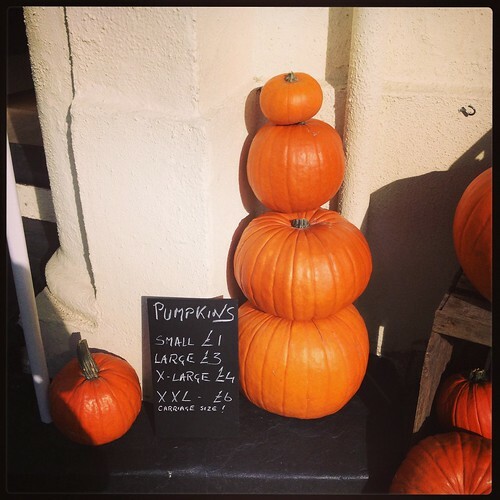 When I saw these pumpkins outside a shop I knew I had to photograph them. Especially as it was a beautiful sunny day, perfect for taking lovely autumn pictures. Hopefully I'll be able to take a few more autumn photos like this before winter arrives. Love the sign... Carriage size! Lately I seem to be snapped out of any good dreams I'm having by small people waking up far too early with the clock change. I know, isn't carriage size a great way of sizing pumpkins!